This is a Relief Sculpture, with the Moon raised from the Sun, is a Birth Announcement Customized with Babies Name & Birthdate. It can be Personalized or Customized with the Babies, Name, Birth Date. Pegs for Hanging babies clothing or favorite toys. To create a sculpture in relief is to give the impression that the sculpted material has been raised above the background plane. What is actually performed when a relief is cut in from a flat surface of stone or wood is a lowering of the field, leaving the unsculpted parts seemingly raised. The technique involves chiseling away of the background. 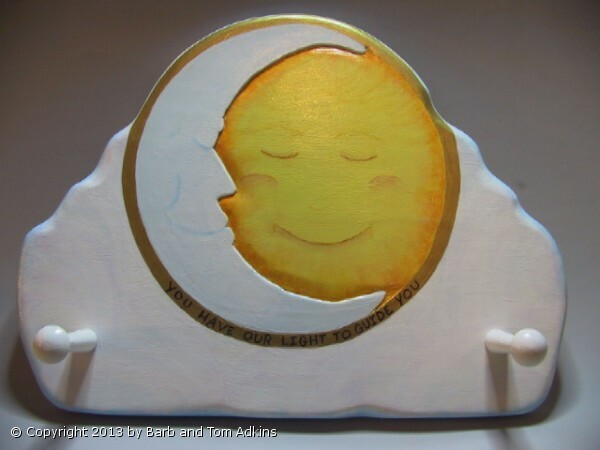 The Sun and Moon Relief piece is a custom order. Tom will do as much relief work or as little relief work as you desire.